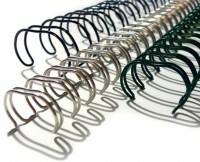 Double Loop Wire has always been the best choice for the customer seeking a high-end look for their presentation, calendar, or proposal. It is offered in 3:1 (3 holes per inch) and 2:1 (2 holes per inch) pitch. Other names in the industry are Wire-O, Twin-Loop, and Double-O. We stock Double Loop Wire in White, Black, Blue, Red, and Silver, with sizes ranging from 1⁄4" - 1". 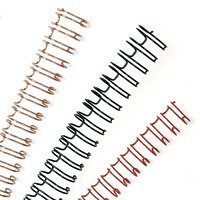 Special cut wire, along with spools of wire and calendar hangers, are available upon request.